+ The only way to get this close to the spots, with a boat! 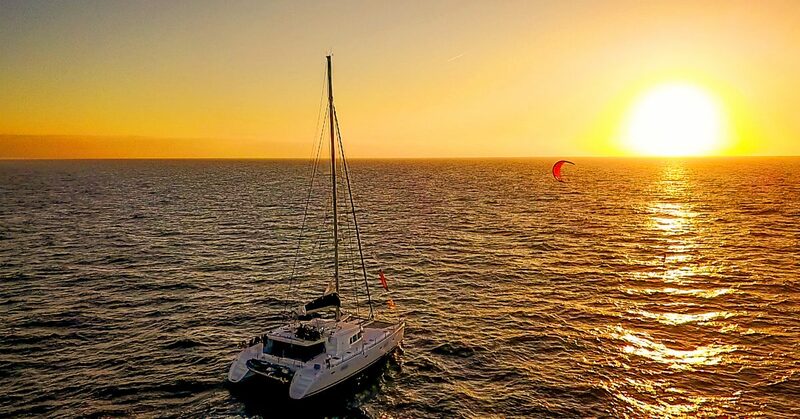 Glide in style from spot to spot with our catamaran. 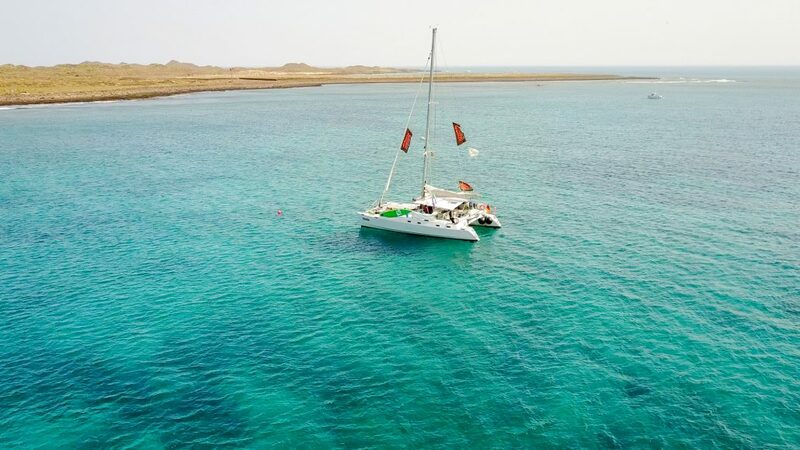 Sail through deep blue waters, anchor in secret bays with snow-white beaches, start your kites from sandbars and enjoy breathtaking landscapes. 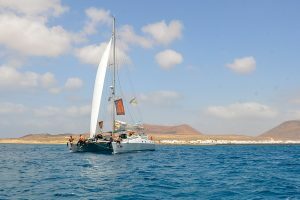 The Canaries are one of the most beautiful sailing areas of Europe. 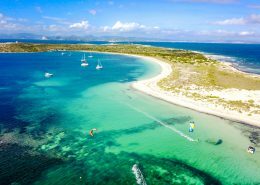 The all year mild climate, dreamlike beaches and the strong Passat Winds pair up to create ideal conditions for a sailing tour with extensive kite sessions! 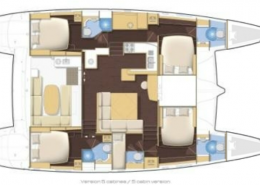 Even adventure captains will be fully entertained on this fantastic expectation. Together you will, if you want to, steer the “Otto Mezzo”. Our captain will show you the basics of sailing! 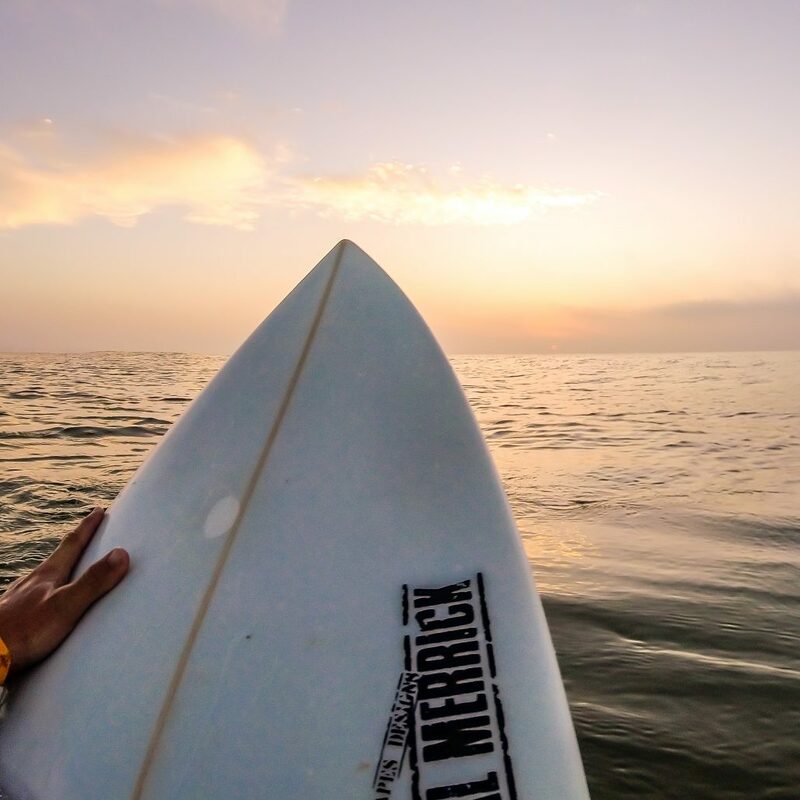 Enjoy the breathtaking variety of nature, explore your limits while having endless downwinders, and spend your evenings, together, at the charismatic fisherman’s villages along the coast. Come and live this unforgettable adventure with us. 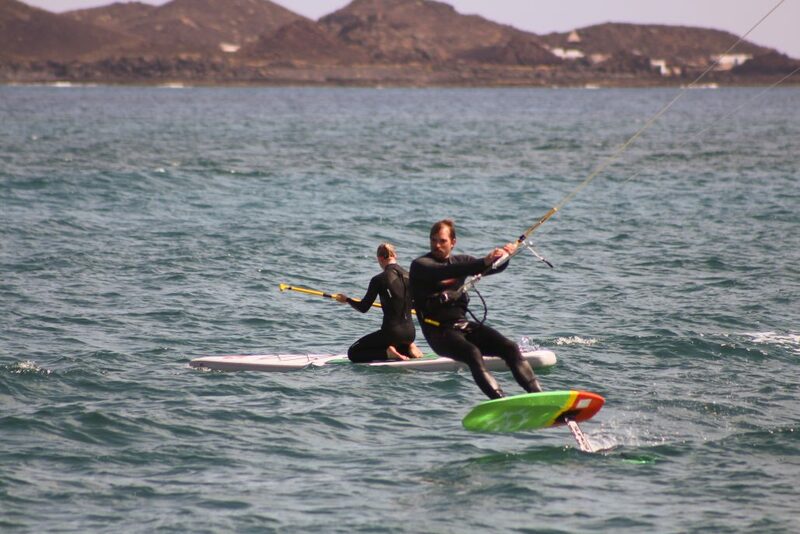 The event suits all kiters who are VDWS level 5, who are able to stay upwind safely. Ship ahoi and welcome on board! 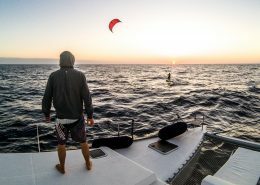 Due to some strong trade winds, this event suits mainly advanced kiters who are able to stay upwind safely. However In addition you can book extra lessons with our licensed VDWS instructor to push your skill levels individually. 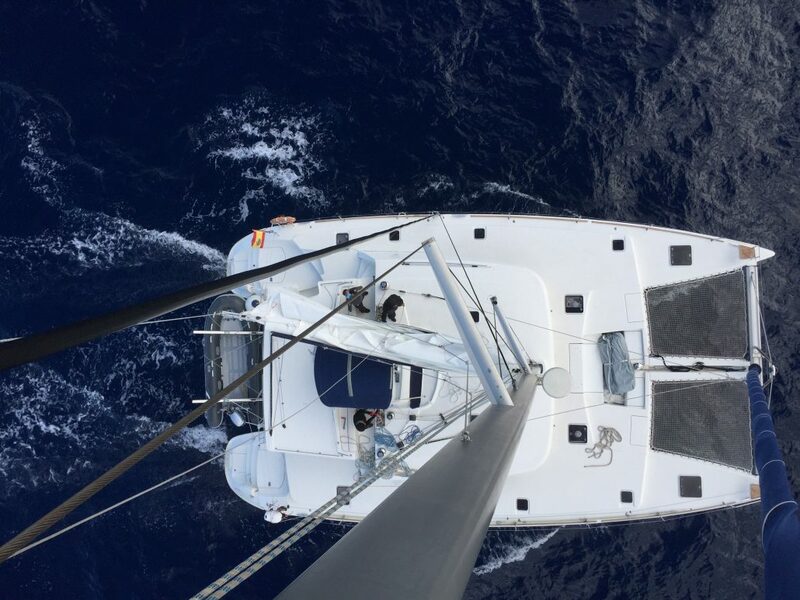 Because of the underside draught of only 140cm on the boat we reach every sandbank easily. There is no need to have to launch your kites tediously at the boat. 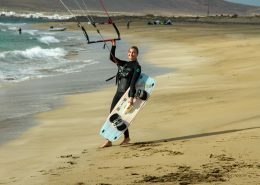 Kite at the shallow water spot on the lee side of Los Lobos or La Graciosa or go surfing in the waves off Fuerteventura. 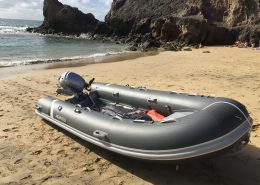 The Canaries offer a unique variety of spots and a lot of action is guaranteed! 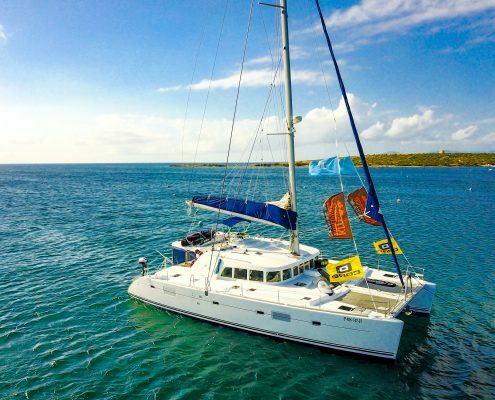 The fully equipped catamaran Otto Mezzo has room for up to eight guests with four double cabins with double beds and a double cabin with a double deck bed. The Otto Mezzo is one of the largest and most comfortable catamarans on the market. 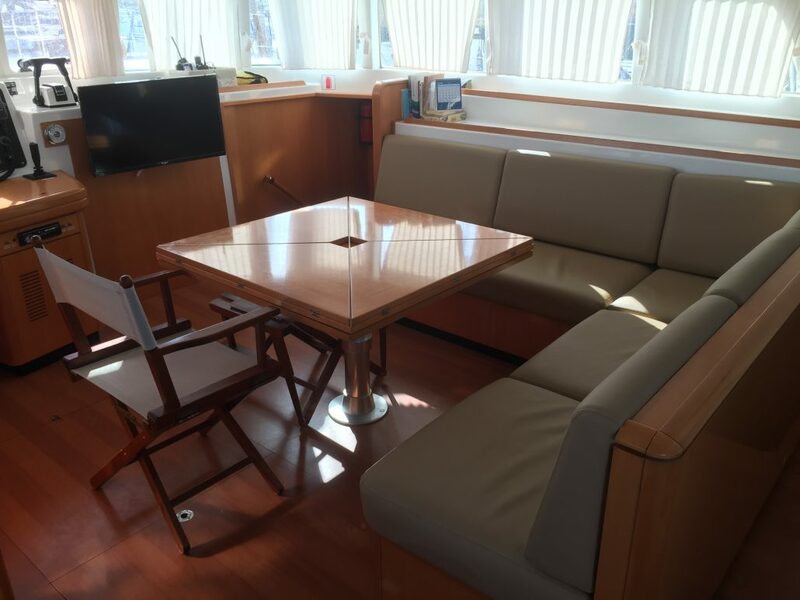 With lots of space in the rooms, a huge seating area in the stern of the catamaran and a number of deck-chairs, Otto Mezzo is the perfect place to relax. 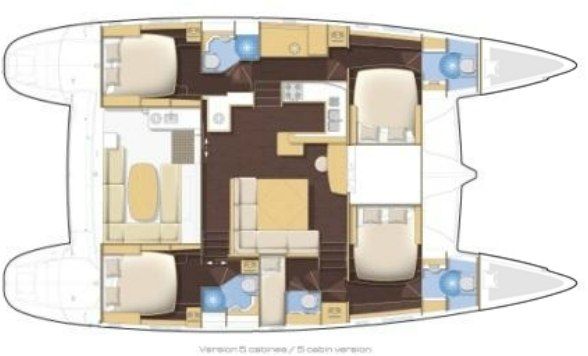 There are also bathrooms with hot water showers in EVERY cabin, a fully-equipped galley with stove, fridge and freezer and a lounge area with flat screen TV and 220V sockets. 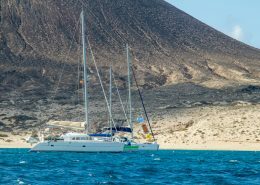 We spend the evenings on our catamaran, perfectly equipped for all situations, anchored in idyllic bays, but we can also explore the diversity of the local ports. 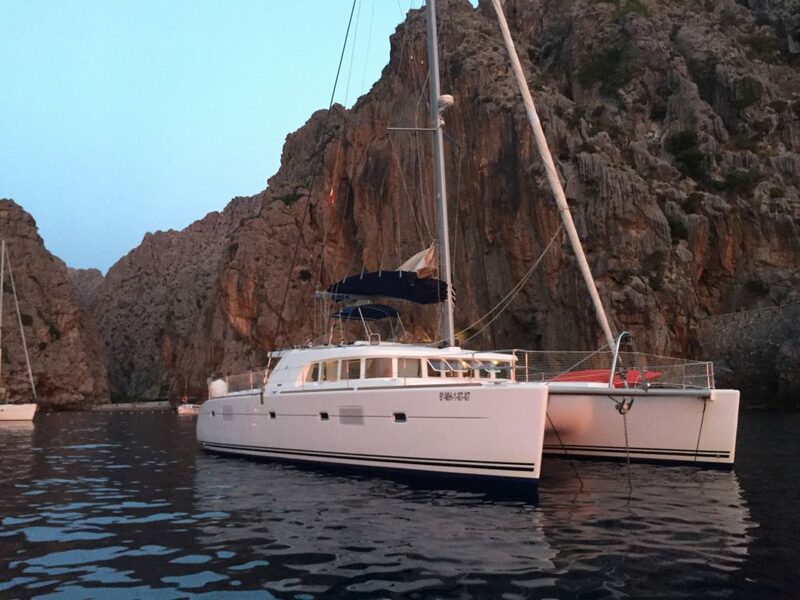 With a draught of only 140cm Otto Mezzo brings you very close to all spots. 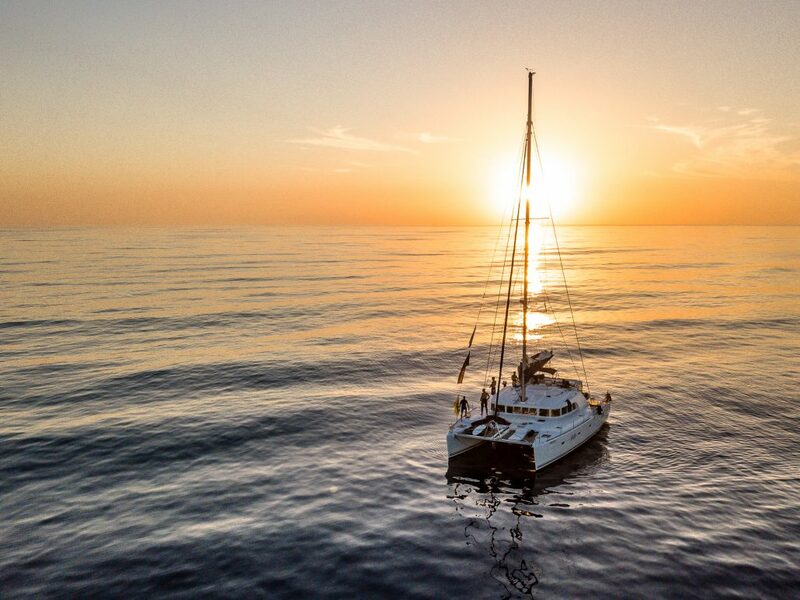 It drives by pure sailing power, but when the rare case of a calm comes up, the Otto Mezzo under engine is also fast at the next spot. 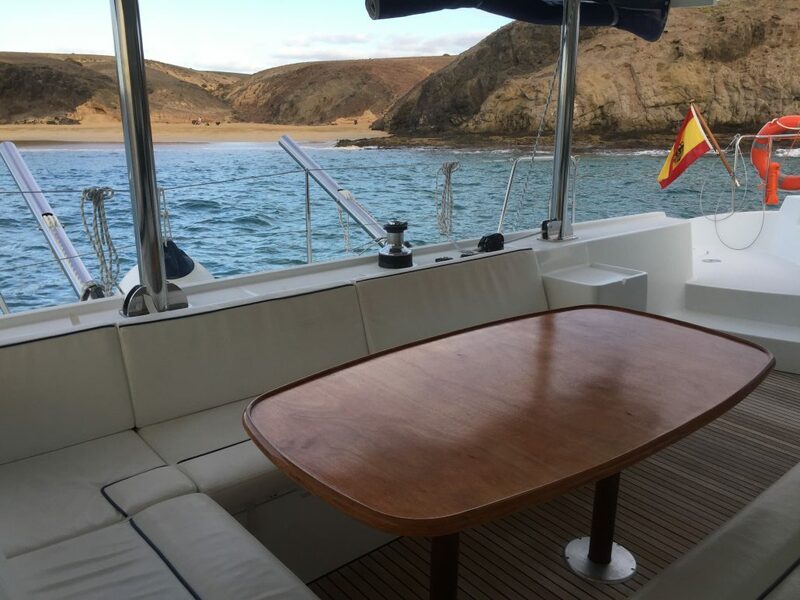 You can also look forward to cooking together on board or explore the local restaurants – just as you like. 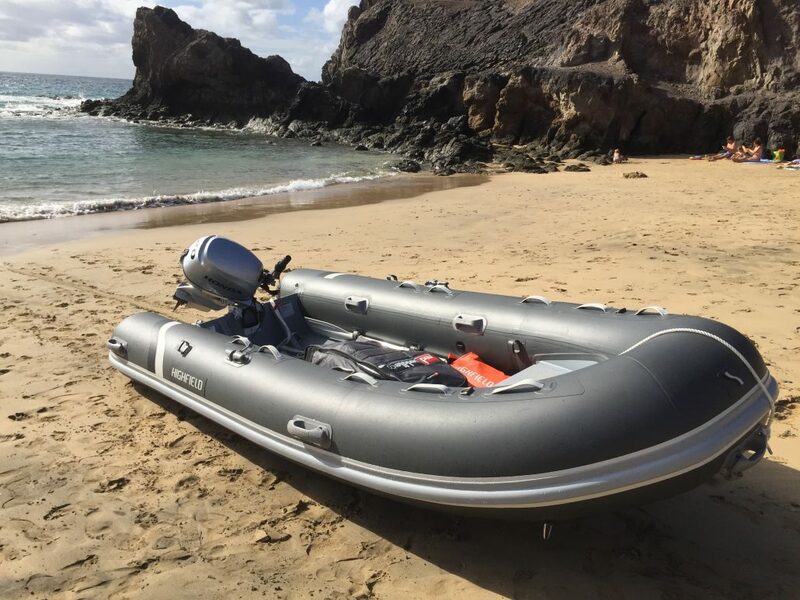 The Otto Mezzo is equipped according to the highest safety standards and meets all modern safety requirements – the catamaran is equipped with, among other things, lifeboat and life rafts as well as saddleite controlled emergency call devices. 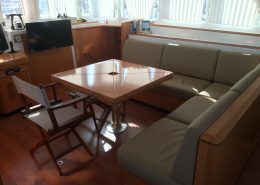 The cabins are very large for a catamaran. The bunk beds are comfortable and spacious enough for everyone. 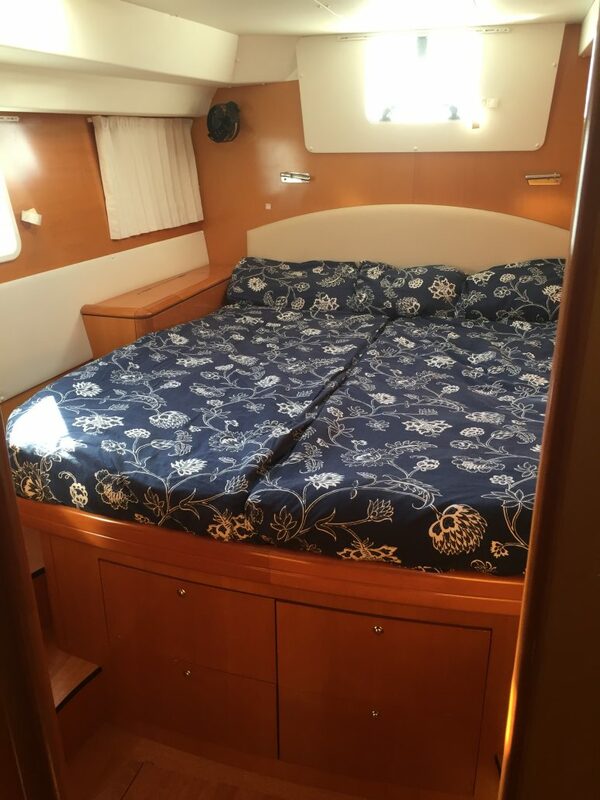 The double beds in the double cabins are separated from each other by a soft-wall. Let yourself climb out of your cabin to a magical sunrise and the smell of coffee. 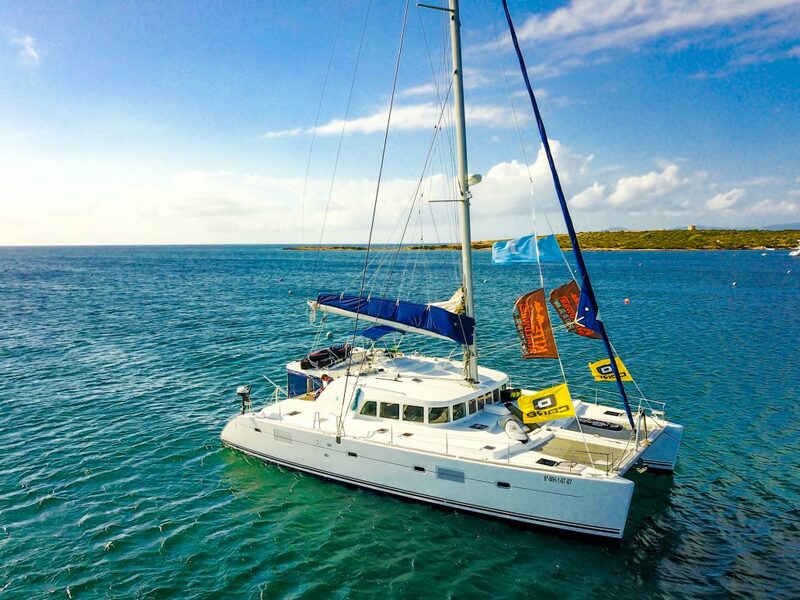 The catamaran with it’s length of 44 feet provide enough space to start your day with a smile. 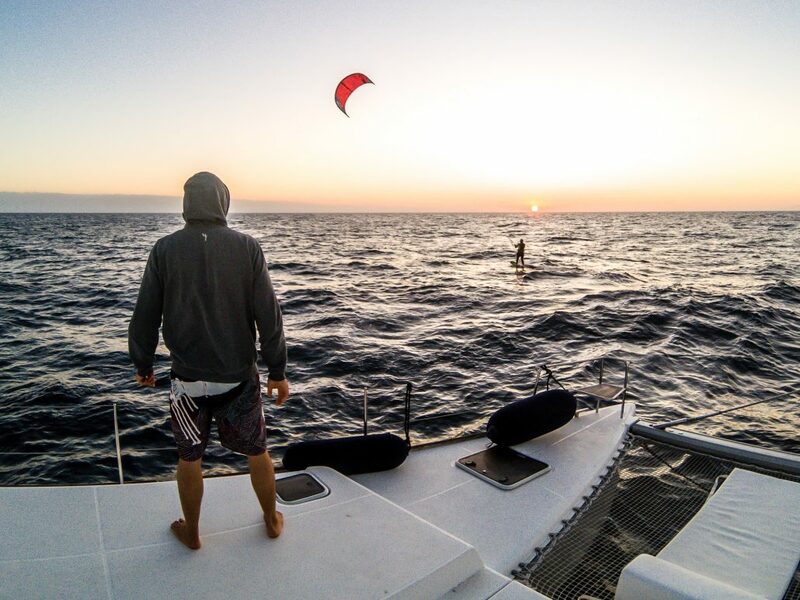 The wind forecast is our destiny and shows us the spot with the best conditions for each day. 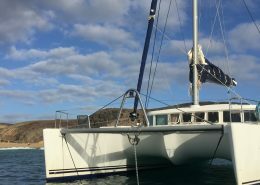 We set sail together with up to 20 knots through the sea. The breathtaking Canary Islands are located right in front of you. Bright sandy beaches and crystal clear water is fascinating us right away. 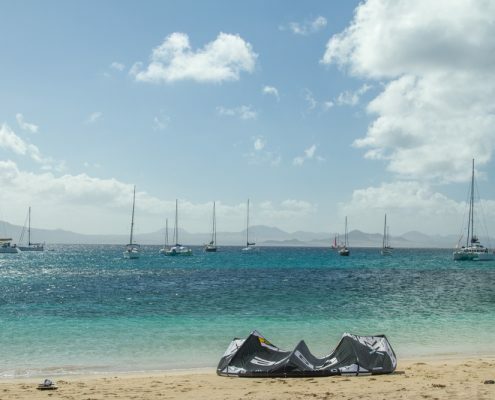 Lonely spots and outstanding wind conditions invite you to anchor and start your kites. We come to an end of an exciting day and head into the next port. We enjoy the surfer atmosphere and cheer with some cold beers in a bar to celebrate the exciting last session. 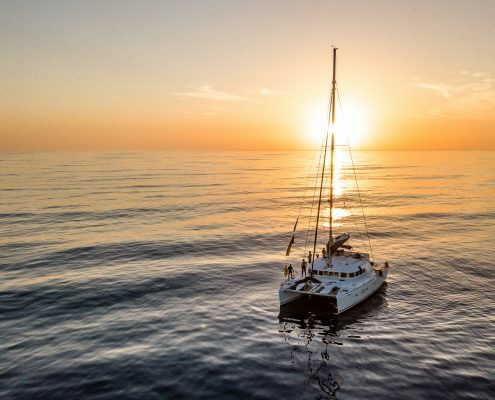 We are currently working on new dates and prices for our Kite & Sail cruises 2019. As soon as they are available, you will find them here. 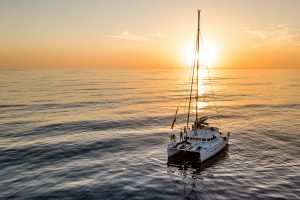 The Sail Basic package includes everything you need to fully forget the daily grind while sailing one week on the high seas. 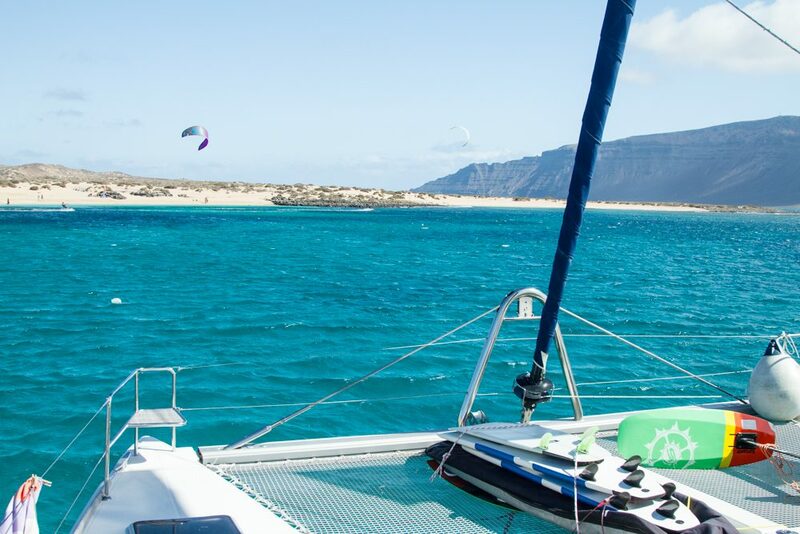 During the whole trip, a VDWS licensed kite instructor will be by your side and, on top of that, you will get the chance to steer the catamaran yourself and test the latest Core kite gear. 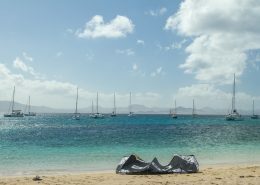 If you don’t have your own kite material yet or you prefer to travel light, you can book the Sail Rent package. 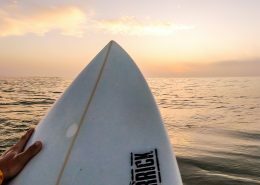 So you will always have a wide selection of kite sizes and you can always test the latest Core gear. If you don’t want to carry your full range of kites with you, we have a complete range of 4-17 m² Core kites on board. 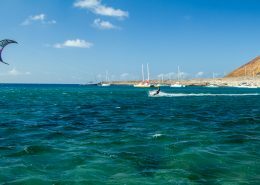 It’s best best if you plan your arrival and departure from the airport or Arrecife on the island of Lanzarote. 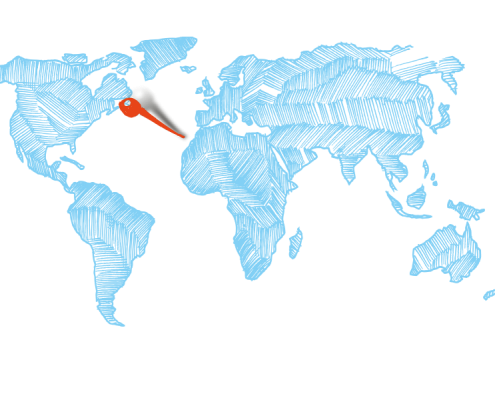 We are happy to help you with the booking process. Boarding on the first day at 4 p.m. we will then have a relaxed lunch. 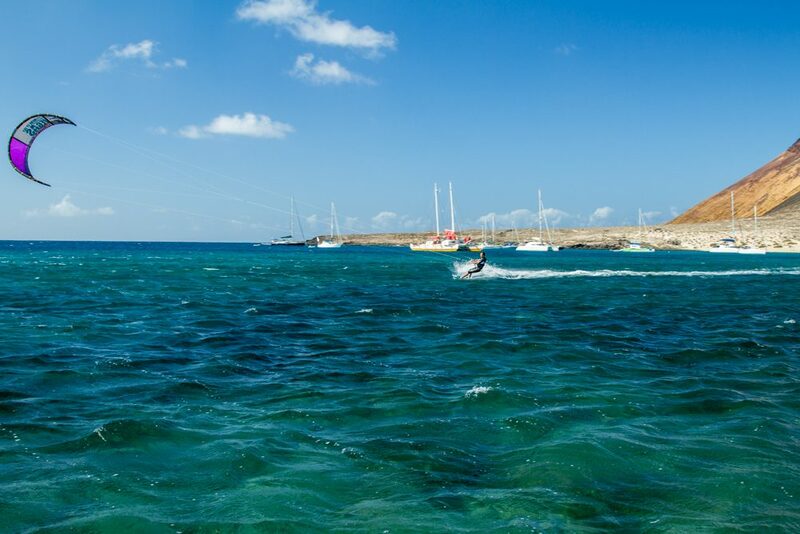 The daily schedule consists of sailing to new spots and maximum kite fun on the water. 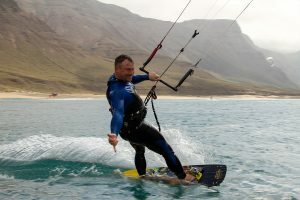 The daily kitesurf time depends on the respective section of the route and the wind conditions. 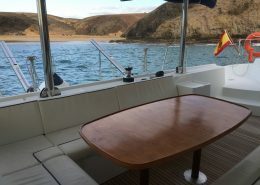 In the evening we dock at beautiful bays or sailboat marinas. On the last day we will have breakfast together from 6:30 till 8:00 a.m.
*At the beginning of the trip 40€ per day and participant will be collected. This will pay for the food on board and the soft drinks, as well as beer on board. 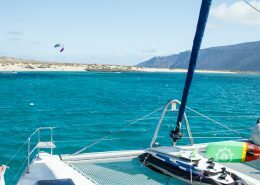 GET A QUOTATION FOR THE KITE CATAMARAN TOUR! 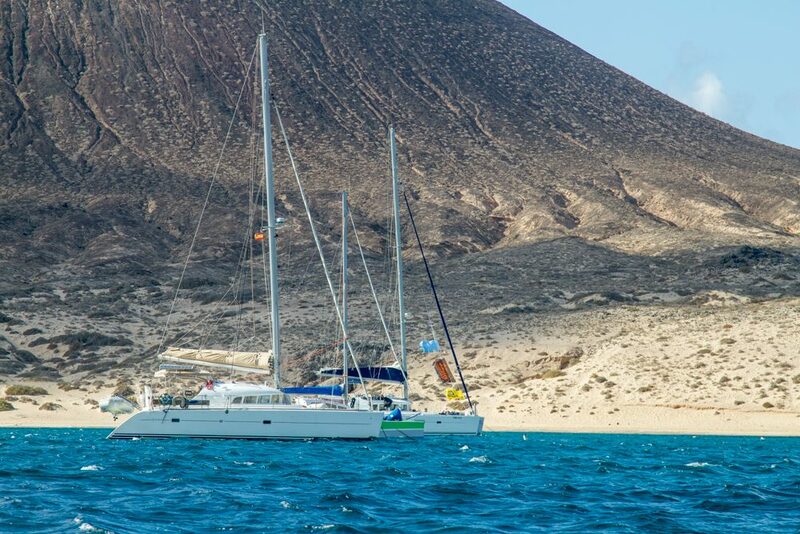 At the beginning of the trip, 40 € will be collected from each participant for each day on the catamaran. Catering on board, port fees, softdrinks and beer will be paid by that. Please feel free to bring other alcoholic drinks with you. We can also cater for vegetarian and vegan diets, but please let us know in advance. The Canaries offer an enormous variety of spots. 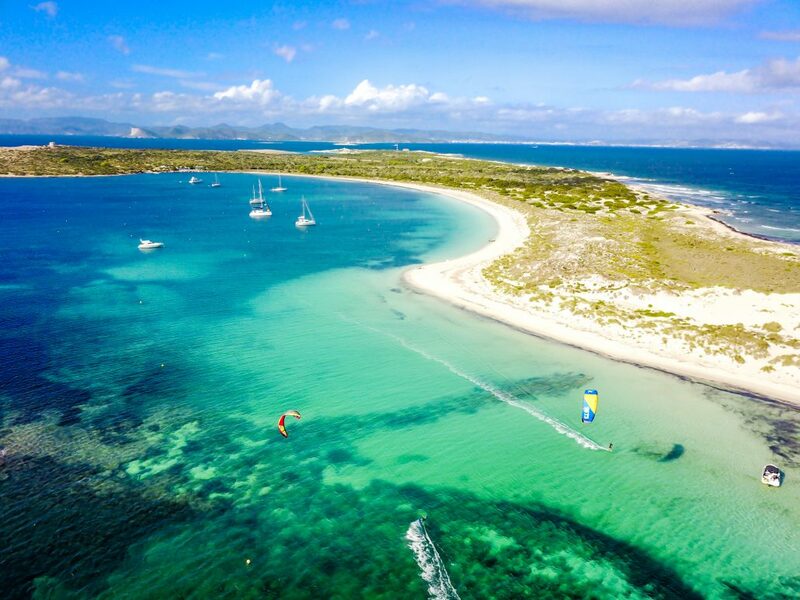 You can expect downwinder, shallow water lagoons as well as swell. 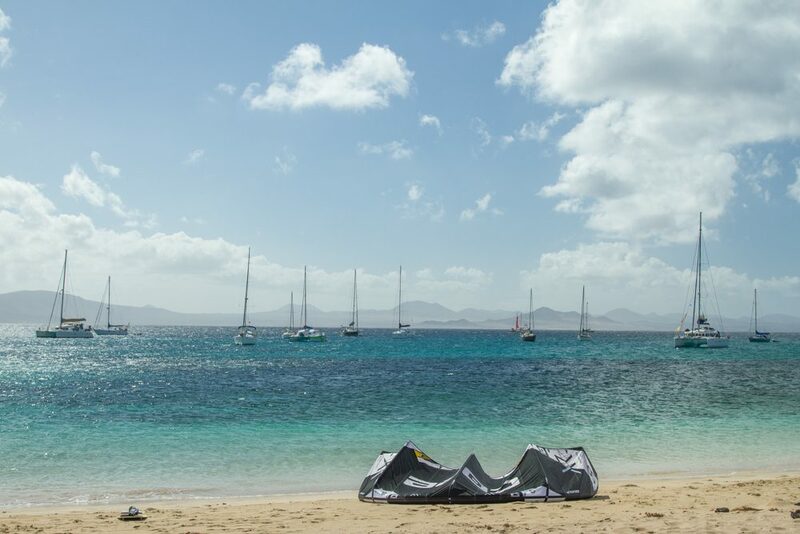 Due to some strong trade winds the event suits advanced kiters. Because of the underside draught of only 140cm on the boat we can reach every sandbank easily. So, you don’t have to launch your kites tediously by the boat. 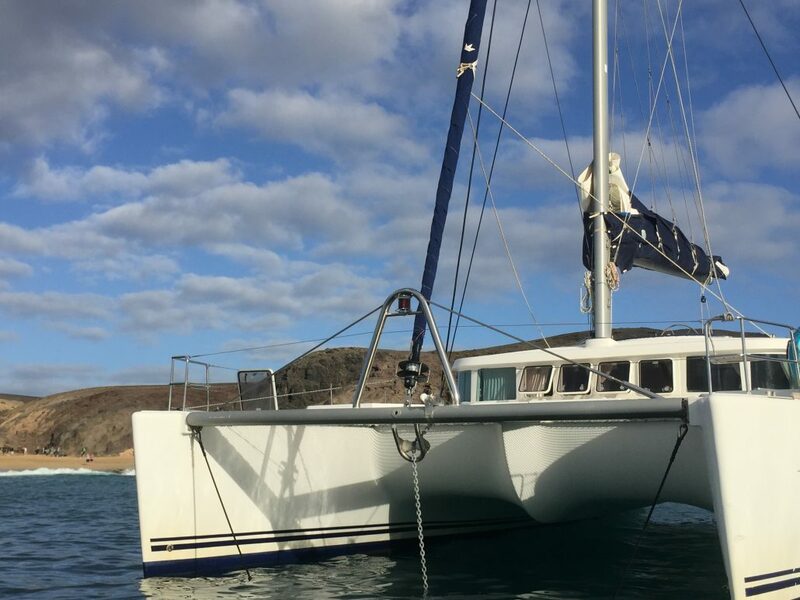 The catamaran provides bathrooms in every cabin. At the ports you find sanitary facilities, warm water showers and everything else you might need. 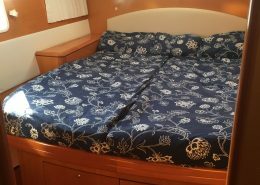 Our certified skippers Tobi & Cathi from Rostock feel at home on all oceans of the world. 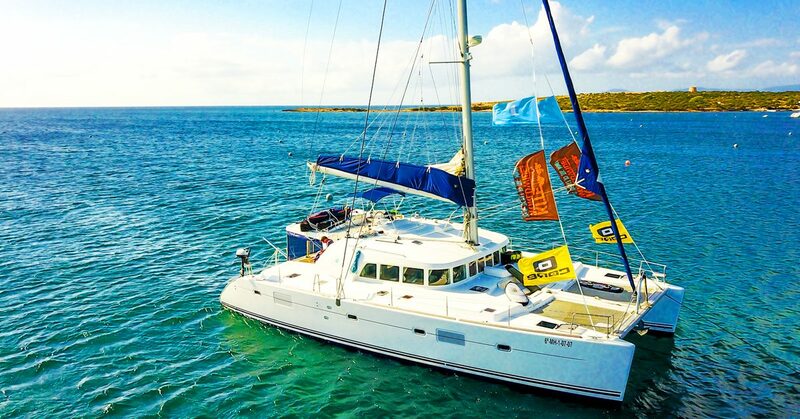 After his nautical studies Tobi gained sailing and skipper experience worldwide on catamarans and monohull boats before he finally founded Charter & Sail. His girlfriend Cathi has also been sailing the seas for many years. 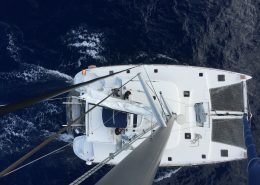 As a marine engineer she knows all the technical details of ocean-going catamarans and monohull boats like the back of her hand. 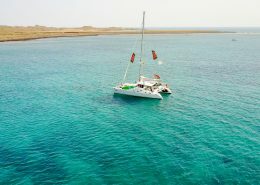 They will bring you safely from spot to spot, familiarize you with the boat and teach you the basics of sailing, if you like. How much wind does it take to learn kitesurfing?